Energy efficiency is a ratio of energy input to useful energy output, often expressed as a percentage. It measures how much energy of one kind is converted into usable energy of another kind. Incandescent light bulbs convert just 5 percent of the electrical energy they use to light, whereas the energy efficiency of compact fluorescent bulbs is between 15 and 20 percent. Power plants fueled by natural gas convert up to 50 percent of their heat energy to electrical energy, compared to about 38 percent for coal-burning power plants. Energy efficiency is never 100 percent, because some energy is always lost as heat, either directly or as a result of friction in between moving parts in such equipment as motors and generators. Increasing energy efficiency conserves fossil fuels, cuts down on pollution, and saves money. Steam turbine power plants reduce their energy or heat loss by insulating pipes and by returning condensed steam to the boiler for reheating. New combined-cycle plants increase energy efficiency by using hot exhaust from gas turbines to produce steam for steam turbines in the same plant. On-site electricity generators often increase energy efficiency by cogeneration, or by combined heat and power (CHP), in which waste heat is captured to heat buildings. Cogeneration is employed in many different industries, with chemical, paper, and petroleum refining plants being the largest users. A number of colleges have also installed CHP generators. Improved technologies, the use of catalysts , renewable or recycled raw material, and recovery and reuse of waste in industry increase energy efficiency. In transportation, fuel efficiency or miles per gallon (MPG) depends on vehicle design, on reducing air resistance by reducing the weight of a vehicle, and on the type of fuel used. Carbon-fiber composites are strong, extremely light materials that could significantly increase fuel efficiency if employed in the manufacture of vehicles. One such material is waiting to be patented, and research into reducing composite production cost, using agricultural and paper-manufacturing waste, along with recycled bottles and plastic car parts, is ongoing. New technologies, such as regenerative braking, which converts momentum to electricity when the brakes are stepped on in hybrid electric vehicles, also increase energy efficiency. Advances in engine-technology design include Compression Ignition Direct Injection engines, which result in less heat loss in gasoline burning engines and which also increase fuel efficiency. Hybrid electric vehicles, as well as alternative fuel vehicles, use less gasoline and cut down on pollution. Flex-fuel vehicles can use gasoline, ethanol, or methanol for fuel. Bifuel vehicles have two tanks—one for gasoline and one for natural gas or propane. There were over 100,000 vehicles fueled by natural gas on the road in the United States in 2000, according to the U.S. Department of Energy. 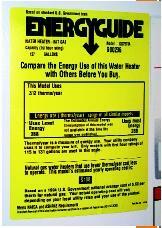 The EnergyGuide label that is affixed to new appliances sold in the United States. trucks, including sports utility vehicles (SUVs). Due to the increasing popularity of SUVs in the United States starting in the late 1980s, the combined average MPG rating fell from 25.9 in 1987 to 24.6 in 1997. Energy efficiency in many areas increased through the late 1980s because of the shortage or threatened shortage of cheap imported oil. This was followed by a reversal or slowing of efficiency gains through the 1990s, when there were ample supplies of cheap fuel. One way in which individuals and business managers can increase energy efficiency is by using Energy Star products. Energy Star is a voluntary labeling program, introduced by the U.S. Environmental Protection Agency in 1992, that identifies energy-efficient products. Manufacturers must test all major appliances to meet energy-efficiency standards set by the Department of Energy. These are displayed on an EnergyGuide label that specifies how much energy the appliance uses, compares this with the energy use of similar products, and notes the approximate annual operating cost. To warrant the Energy Star certification, often displayed on the EnergyGuide label, products must meet stricter energy-efficiency guidelines, set by the EPA and the Department of Energy. For example, Energy Star homes must be at least 30 percent more energy efficient in terms of heating, cooling, and water heating than comparable homes built to the 1993 Model Energy Code. Homeowners can save energy by using low-flow showerheads, lowering thermostat settings, turning off lights and appliances when not in use, sealing windows, installing storm windows, and insulating hot-water tanks. Walking or biking, carpooling, using public transport, and driving a hybrid electric car are ways to conserve gasoline and reduce vehicular pollution. The environmental importance of energy efficiency is highlighted in a 2001 EPA report stating that Americans, partly by choosing energy-efficient products, have reduced greenhouse-gas emissions by 38 million metric tons of carbon, which is equivalent to removing about twenty-five million cars from the road. Bertoldi, Paolo; Ricci, Andrea; and de Almeida, Anibal, eds. (2001). Energy Efficiency in Household Appliances and Lighting. Berlin: Springer-Verlag. Energy Information Administration. (1998). "25th Anniversary of the 1973 Oil Embargo." Available from http://www.eia.doe.gov/emeu/25opec/anniversary.html . Rocky Mountain Institute. (2003). "The Hypercar Concept." Available from http://www.rmi.org/sitepages/pid386.php . U.S. Department of Energy. "Energy Efficiency and Renewable Energy: Energy Efficiency Technologies." Available from http://www.eere.energy.gov/EE . U.S. Environmental Protection Agency, and U.S. Department of Energy. "Energy Star." Available from http://www.energystar.gov . U.S. Environmental Protection Agency, and U.S. Department of Energy. "Fuel Economy." Available from http://www.fueleconomy.gov/feg/index.htm .